By Sophie Kaplan on Monday, October 9th, 2017 at 2:46 p.m.
Trinity Broadcasting Network's Mike Huckabee interviews President Donald Trump in a friendly discussion on Oct. 7, 2017. Former Arkansas Gov. Mike Huckabee landed an interview with President Donald Trump on the GOP pundit’s new show on Trinity Broadcasting Network. 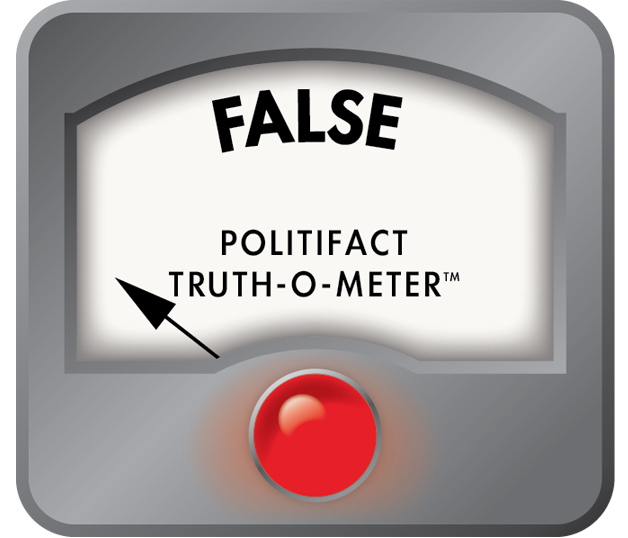 Trump made several flawed claims that we have previously fact-checked and corrected himself on another talking point in the premiere episode of Huckabee. Huckabee made an interesting claim about first lady Melania Trump that we wanted to look into, too. "We are the highest taxed nation in the world." Trump would have been more accurate if he had said the United States has one of the highest corporate tax rates in the world. However, companies pay less in practice because they can take deductions and exclusions. "We are the highest-taxed nation in the world." "We have more than $3 trillion overseas." Trump more accurately referred to the most recent estimate of untaxed corporate earnings in overseas accounts than he has in the past. Because there is no public estimate on untaxed earnings overseas (reporting is not required by law), researchers can instead look at the indefinitely reinvested earnings on financial statements of publicly traded companies. According to Audit Analytics, there was $2.8 trillion of indefinitely reinvested earnings sitting overseas as of July 2017. That could be off by a couple hundred billion dollars due to undisclosed untaxed earnings, we found. Says mayor of San Juan, Puerto Rico, "was the lone voice that we saw, and of course that's the only voice the media wanted to talk to. And she is running for governor." There’s no doubt about the official in question: San Juan Mayor Carmen Yulin Cruz. But was she the only Puerto Rican government official to criticize the federal government’s response to Hurricane Maria? In a previous fact-check, we noted that Gov. Ricardo Roselló was grateful for all the help they had received, but he expressed the need for more resources. "Administration, they've been helpful up until now," Rosselló said. "But we need more help. We need more help. We need more resources. And at the same time, Congress solidarity and all of the help that they've pledged through social media and phone calls with our staff. Now is the time to materialize it." In another article, we looked at the mayor’s efforts on the ground and working with the Federal Emergency Management Agency (FEMA). We said that how well the mayor worked with FEMA is not always an indicator of how well of a job she did overall. Former Puerto Rico Attorney General Jose Fuentes accused the mayor on CNN of using the hurricane to make a name for herself for a gubernatorial bid. But she has not announced she is running for governor. "Enthusiasm for business and manufacturing is the highest it has ever been in the history of these various indicators that do it. I think that’s 28 years." Trump has talked up record-high "business spirit" or enthusiasm for months. We have consulted a few measures to see what that could mean. The Business Roundtable’s CEO Economic Outlook, a survey that asks CEOs to report expected sales and spending and hiring plans for the next six months, showed that in previous quarters there were higher ratings than in the current quarter. The highest rating is 113, after the first quarter of 2011. The most recent rating under Trump is 94.5, as of Sept. 30, 2017. The current index is at the highest it has been since the third quarter of 2014. The National Federation of Independent Business measures small business optimism. According to that measure, optimism was at its highest point since 2012 in January 2017 at 105.9. It dropped through June 2017 to 103.6 before starting to rise in August 2017 at 105.3. We looked at several other measures of what this "enthusiasm" could mean, such as the Institute for Supply Management’s Purchasing Managers Index and the YPO Global Pulse, but did not find support for Trump’s statement. "I want to give (peace) a shot before I even think about moving the embassy to Jerusalem." After David Friedman, the U.S. ambassador to Israel, told TBN earlier in the week that he is "convinced" the United States will move the embassy in Tel Aviv to Jerusalem within Trump’s term, Huckabee asked Trump for a timeframe on the move. Trump responded the move will happen in the "not too distant future," but he wanted to first try to make peace between Israel and Palestine. This marked a step back from a campaign promise. We continue to rate it Stalled on the Trump-O-Meter. Huckabee: "Does it sometimes bother you that she (Melania) has fantastic approval ratings, soaring above anybody else in the entire city of Washington?" Trump answered Huckabee’s question with a smile, saying the first lady "is very popular." But is it true that she has the highest approval ratings in the capital? A CNN poll at the end of September found the first lady is the most popular among four members of the family that included Donald Trump, daughter Ivanka and son-in-law Jared Kushner. For Melania Trump, 44 percent of respondents said they have a favorable view of her and 35 percent had an unfavorable view. Her husband, had 41 percent favorable and 57 percent unfavorable. CNN noted that first ladies generally have a higher approval rating than their husbands, which likely stems from not taking divisive policy positions. Her rating in the CNN poll out-performed ratings of other politicians in an Economist/You Gov poll from Oct. 1-3. Speaker of the House Paul Ryan: 24 percent favorable/52 percent unfavorable. Vice President Mike Pence: 41 percent favorable/41 percent unfavorable. Senate Majority Mitch McConnell: 16 percent favorable/53 percent unfavorable. House Minority Leader Nancy Pelosi: 28 percent favorable/48 percent unfavorable. Senate Minority Leader Chuck Schumer: 27 percent favorable/37 percent unfavorable. We found a possible exception to Huckabee’s statement from a poll taken in mid-to-late September. A Harvard-Harris poll found Sen. Bernie Sanders, I-Vt., to have a 53 percent favorable rating and a 37 percent unfavorable rating. That was the highest ranking of American politicians from both major parties.